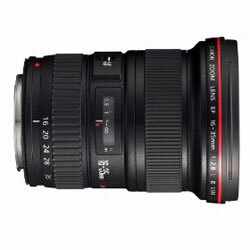 Photozone has reviewed the Canon EF 16-35mm f/2.8 USM L II lens on a full frame DSLR camera body. This lens is quite interesting with its wide focal length and constant f/2.8 aperture. It is targeted at the professional with its hefty price tag. Photozone ends up giving the Canon EF 16-35mm f/2.8 USM L II lens a pretty good review, but it has some shortcomings. You do not get top results when the lens is used wide open and there is some vignetting at the widest settings on a full frame camera. Overall this seems like a good lens, but it could be better..
Read the full review of the Canon EF 16-35mm f/2.8 USM L II lens here.